I know, it’s kind of a weird question. You are probably thinking – he took all this time off from writing this blog and this is what he came up with? Sadly, for some reason it came to me today. I don’t know why I was thinking about the Muppets, but then why do we think about half the things that come into our heads during the day? Anyway, I do have an answer to this question. Now if we are talking about Sesame Street, which I think are not really part of the Muppets, I would have to choose the Count. Now I remember when the Count first came around and was a little more edgy, when he could actually hypnotize people into silence and things like that that a real vampire could do. That was the Count I always liked. Not that there was anything wrong with the Count after that. He was funny and served his purpose, but there was something more appealing about him earlier on. 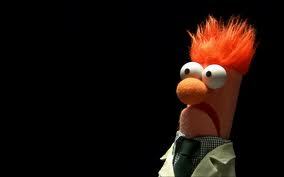 It has to be Fozzie vs. Beaker. Now Beaker never talked, but there was something about the way that he expresses himself and the way he was always getting into Three Stooges-like situations that made you have to smile and laugh every time he was on-screen. Fozzie was the lovable vaudeville comic who’s jokes were so bad that you usually cringed instead of laughed, but he has a certain amount of sincerity and caring about him, and he does actually seem to come up with some funny lines that most kids probably didn’t get at the time. 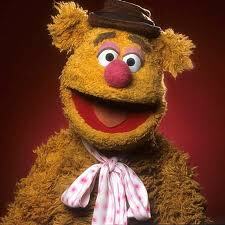 So I think if I had to choose for myself, I would go with Fozzie. So what do you think – who is your favorite Muppet? You can choose someone from Sesame Street; I won’t hold it against you if that’s what you like best. You can leave an answer on here or on Facebook or Twitter. I am curious to see if I can get any celebrities on Twitter to answer me as well. I’ll post if they do. Next time, we’ll see what I can come up with. You never quite know what it is going to be. Let’s think of this more as a stream of consciousness blog for now. Sometimes it will be questions, sometimes baseball, maybe music, movies, current events, writing, it’s really whatever happens to strike me at the moment. We’ll try it that way for a while and see how it goes, okay? If you ever have a suggestion, question or just feel like saying hi, drop me a note or comment. I’ll be back. have to say that I like Mrs. Piggy from The Muppets. She was vastly different to how they showed female characters to young kids, and while I didn’t really want to be like her I valued her uniqueness. I have to agree about Miss Piggy. It’s not often she is thought of in that light but you are absolutely right, she was a strong, independent female character. Thanks for the great insight.